This Earthcache is about the formation of gems and gems in Namibia. TO LOG THIS CACHE AND QUALIFY you must answer the questions. Any logs not accompanied by the answers within 7 days will be deleted. 1) What are the 5 requirements for crystalisation? 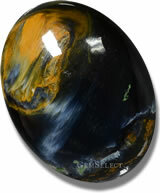 2) When was Pietersite first discovered? 3) What are the four ways gemstones can form? 4) What is the weight of the largest crystal on display in the world? 5) On the landing on the stairs to the first floor is a rock containing crystal. What colour are the crystals? (Locational question). The coordinates take you to the Kristall Galerie where there is a display of a large variety of gemstones, including the largest crystal on display in the world. An entrance fee is payable. Most people have tried to grow a sugar crystal by taking a pot of water and stirring in as much sugar as possible. When you saw it settling on the bottom and no more dissolves, you have reached the saturation point. The water has absorbed all the sugar it can and this condition is called super-saturated. Then you put the pot on the stove and heated it to boiling point. The saturation level changed. The solution was no longer super-saturated and you could add considerably more sugar until you reached a super-saturation level. After that you would hang a string in the put with a weight and allow the liquid to cool. As the water cooled to room temperature, the amount of sugar it can hold in suspension will return to the previous level. The excess sugar must come out of the solution and, as it does, it will crystallize, hopefully on the string to form a large sugar crystal. The sugar crystal demonstrates one of the principles of crystallization, viz as the temperature of a liquid drops, the amount of solid ingredients it can hold in suspension drops as well. Inside the earth, the ingredients are more complex than our sugar solution. You will actually have different minerals crystallizing from the same solution at different temperatures. For example corundum might crystallize first and then as the solution continues to cool, topaz might form and later quartz. Pressure has no affect on our sugar crystal, but it takes the proper combination of pressure and temperature for minerals to crystallize. Two other conditions are needed for crystallization, time and space. These are simple. The right combination of ingredients, heat, and pressure must last long enough for the minerals to crystallize. They also need room to grow. Obviously, you cannot grow an inch long crystal in a 3-millimeter wide cavity. A few gemstones form in the mantle, but all gems are mined in the crust. The crust is made up of the three kinds of rock mentioned above. Some gemstones are associated with one kind of rock in particular; others with several types. The igneous process involves the solidification of magma. Magma from the mantle can rise to the crust, usually through volcanic pipes. If it reaches the surface of the earth, it solidifies as lava. However, if the magmatic mass cools slowly in the crust, it can crystallize and form minerals. Increases in pressure can also cause this pegmatitic fluid to infiltrate surrounding rocks, often making chemical exchanges with them. The long list of gemstones formed from igneous rock include the chrysoberyl group, all quartz (including amethyst, citrine and ametrine), beryl (emerald, morganite and aquamarine), garnet, moonstone, apatite, diamond, spinel, tanzanite, tourmaline, topaz and zircon. Once the igneous rock reaches the surface of the earth, the forces of erosion and weathering produce smaller particles, which accumulate on the surface or are moved by wind and water. As time passes, layers of these sediments build up on land or under water. The pressure from the upper layers causes compaction in the lower layers, along with various chemical and physical changes such as lithification, which lead to the creation of sedimentary rock. Evaporation is another process that produces sedimentary rock, such as the rock found in deserts. Gemstones associated with sedimentary rock include jasper, malachite, opal and zircon. The presence of intrusive magma in an area (known as contact metamorphism), or of tectonic plate interactions on a larger scale (known as regional metamorphism) puts igneous and sedimentary rock and minerals under heat or pressure that may cause changes in their chemistry and crystal structure. The result is the creation of metamorphic rock. 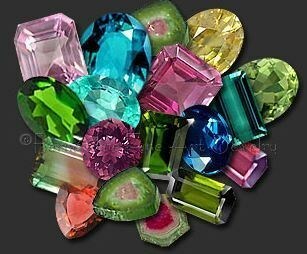 Gemstones associated with metamorphic rock include beryl, jade, lapis lazuli, turquoise, spinel, ruby, sapphire and zircon. 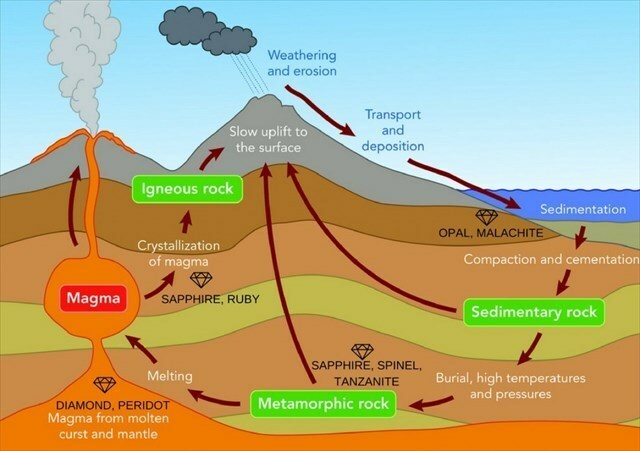 Rocks and minerals are in a constant state of change, which is referred to as the rock cycle. Igneous rock can change into sedimentary or metamorphic rock. Moreover, sedimentary rock can change into metamorphic or igneous rock. Furthermore, metamorphic rock can change into igneous or sedimentary rock. This is known as the rock cycle. Gemstone colours depend mainly on the chemical composition of the crystal. Many minerals are colourless in their pure form but the inclusion of impurities in their structure lead to their colouration. Crystals of the same composition can have different colours. Namibia has a geology that suited the formation of crystals. In fact a unique crystal, Pietersite was discovered by Sid Pieters in 1962 while he was prospecting in Namibia. His discovery was published in 1964, and the material was named pietersite. The Kristall Gallerie was founded in 1998 by Johannes Adolf Kleynhans. What started out as a hobby, collecting stones and revise them, became a lifelong desire to collect the beautiful gems. It is the home of the World's largest Quartz crystal cluster on display, measuring 3 metres x 3.5 metres and weighing 14.1 tons. It was discovered by Kleynhans who was mining for tourmaline on his farm Otjua in the Karibib district in 1985 when the drilling equipment suddenly disappeared into a black hole in the earth. He found a cave formed by a vacuum 45 metres deep where crystals have had the freedom to grow undisturbed over millions of years to form giants rarely seen in our world above ground. The Gallerie is filled with gems and crystals of all types and is a major tourist attraction in Swakopmund. McCarthy T & Rubidge B (2005). The story of Earth & Life: A Southern African perspective on a 4.6-billion-year journey.